A fictional piece based on fact. 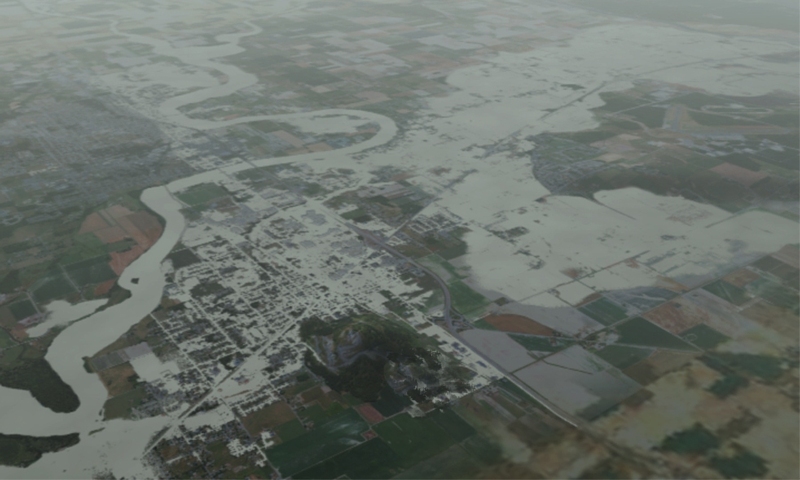 The year 2011 was referred to locally as “the year of the big flood”. Like 2055 it too was a “normal year”, coming off the tail end of a La Nina year which meant Skagit County did not have spring/summer until mid-July. With respect to flood control/flood risk management Skagit County was where it had been for over a century, stuck on talking about it. The 82nd “study” was in the process of being reset. Over a 100 years worth of studies, tens of millions spent on them, and still nothing responsible had been done with the exception of obtaining minimal storage behind the dams. The levees that were built on top of volcanic lahars and placed too close to the edge of the river in the lower valley had only supported a terrible sense of false security. Funding as always was a problem. Ironically it was also the year that the great Mississippi had another 100 year flood, the fourth in 18 years. However, in 2011 the Corps of Engineers blew levees and opened spillway gates in order to put the water onto the floodplain where the river belonged. (See 5/5/2011 Southeast Missourian: Floodway long a source of legal contention, 5/6/2010 Southeast Missourian: Corps shifts focus to East Prairie after final Birds Point breach, 5/6/2011 Time.com After Birds Point: The Army Corps’ Missouri Floodway Boondoggle, 5/13/2011 WWLTV.com: People in Bayou communities prepare for flooding from swollen river , 5/13/2011 WWLTV.com: 'What gives them the right to flood us?' asks Gibson woman) Yes, some people who farmed the floodplains were flooded, but the urban areas and their multi-billion dollar infrastructure which arguably did not belong there, were saved. As referenced above, the concept of spillways/bypass/floodways in the Skagit Delta had been discussed for many years but never implemented. On a dark and gloomy day on November 1, 2011, the rains came. The Pineapple Express was forming in the Pacific. It rained solidly for over three weeks; sometimes it seemed in torrential downpours. The Skagit reached flood stage 5 times in 21 days like it did in 1995. (See 1/27/2011 Historic Flood Flows of the Skagit River) Then, on Thanksgiving Day, with the Skagit still rising in Concrete, the saturated levees began to give way. First to give way was the artificial levee the Dike District put on top of the railroad tracks along Highway 20. The irony was that a large part of that water was being pushed there by the very Dike District that placed the artificial levee. Then Lafayette Road, used as a levee, broke. There were rumors that someone from Clear Lake actually blew it up but that was never proven. More likely than not it was due to the small earthquake experienced in the late summer that liquefied the volcanic lahar soils under the road and the tree that came down in the infamous volcanic lahar 1,600 years ago shifted thus creating a vacuum under the road. The river was loose and on a rampage on its way through Burlington to Padilla Bay, but due to the irresponsible construction of I-5 by the WSDOT the water began backing up to heights never before experienced in the town. Following the experience on the Mississippi, in order to save part of the town of Burlington, the levees were breached in the Avon area hoping that it would draw more water downstream since it was going to Padilla Bay anyway, where it had gone so many times before. Once the raging Skagit made it across Highway 20 and Bay View Hill it continued on its way to Samish Bay, further adding to the misery of the Samish community as due to the heavy rains, the Samish River was way above any level seen since the early settlers. Ever since the Samish farmers tried to contain the Samish into a ditch instead of the five distributaries it had in the late 1800’s (See 1860s Surveyor Maps) the Samish flooded with great regularity. So after the “Great Flood” and its two billion dollar price tag the community finally had enough talk. Dam owners that did not provide the proper amount of storage were sued for the value of property that was lost. Local planners that trashed the State Environmental Policy Act (“SEPA”) and local floodplain ordinances approved by FEMA were fired. FEMA Region Ten personnel who did not enforce the NFIP guidelines and never looked at the cumulative impact of all that landfill east of the interstate had their pensions cancelled. The state Dept. of Ecology officials that did not properly oversee cumulative impact analysis of SEPA suffered the same fate as the FEMA personnel. WSDOT who was directly responsible for increased depths and velocities and failed to do any hydraulic analysis of the landfill they put into the floodplain or take any responsibility for the development they were causing to take place were also sued for the monetary damages that they caused. Many employees lost their jobs. Others that suffered the outrage of the community over the man-made damages were the Dike District who was not only responsible for diverting the natural course of the river but continued to put fill in the floodways without proper permitting thus narrowing the channel and causing it to carry less water and increase velocities that ultimately took out the Anacortes Water Treatment Plant and destroyed part of West Mt. Vernon. 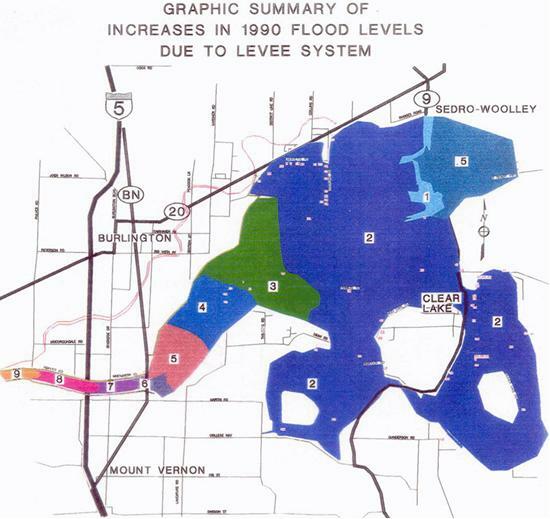 The Corps of Engineer employees, who continued to rebuild the levees without checking if the proper permits had been acquired to put the levees at their current elevations over the years, all in violation of PL-84-99 as well as violating the NFIP regulations that designated the lower valley levees as floodways, were fired and lost their retirement benefits. (See FEMA -- The Total Failure Package) Municipal lawyers who knew their clients were breaking the law but chose to look the other way, were not only named as defendants in multiple litigations but were ultimately disbarred. Well the community and society in general had finally had enough of talk, lies, mismanagement, incompetency and multi-million dollar studies that accomplished nothing but keeping government employees employed. Once they expounded their pound of flesh for the damages they set about doing the obvious. Taking their lead from what happened on the Mississippi, they decided to do the right thing and give the river a place to go. Something that was obvious to even an eight year old little boy after the 1990 floods. So they finally realized that dealing with the Federal government had been an expensive business deal that led them nowhere they decided to “Let’s do the job ourselves” and formed their own flood control council and raised the sales tax to pay for a spillway at Avon. Much the same as was originally proposed by H. L. Willis, Mt. Vernon businessman and chairman of the very first flood control committee in 1922. (See 1/5/22 Argus Fire First Gun In Flood Fight) They prohibited any more infrastructure from being built in the floodplain. Residential construction was strictly prohibited and commercial development was only allowed after the developers signed documents that forced them to take responsibility for the impacts the structures they built were having on flood flows. They designated the Avon area to Padilla Bay as a floodway under the NFIP regulations. 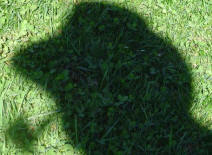 Anyone living in the floodplain had to have flood insurance whether or not they were protected by 100 year protection. They purchased flowage easements from the property owners and prohibited any new structures from being built in the floodway. Part of the legal settlement with WSDOT’s induced flooding was that WSDOT was required to raise Highway 20 so that no water could get into the Samish basin. In 2014 the construction of the spillway was completed. Proper storage based on correct hydraulics was obtained from the dam owners which in its own way really only delayed the more serious floods but did have a very positive impact on the smaller flood events which greatly helped agricultural endeavors. So here we are, in 2055, Thanksgiving Day, and the spillway gates were opened. The mighty Skagit was free again on her floodplain. On the way to Padilla Bay, and unlike 2011, there were no damages in Burlington. I-5 was not shut down as WSDOT had engineered it to do so. Due to the interior drainage improvements in conjunction with the spillway gates, as soon as the Skagit started to recede below flood level and the tide went out, the drainage gates were opened and the farmland drained into Padilla Bay. There was no catastrophic flooding as there was in 2011. Only a controlled response to living with our most important neighbor, Mother Nature. Mother Nature has left her footprints in the sand. Walk in Her moccasins. She will show you your past and in so doing She will show you your future. LETS DO IT OURSELVES!! LETS DO IT NOW!! LETS DO IT WITH VOTER APPROVAL!! May your fields be ripe and budding and your rivers full and flooding (because its the only time people pay attention).